Black t-shirts with the shape of the continent of Africa formed from encouraging words about the love God has for orphans. 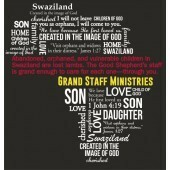 "Abandoned, orphaned, and vulnerable children in Swaziland are lost lambs. The Good Shepherd's staff is grand enough to care for each one--through you." Very soft, 100% cotton.